Closing the series of posts in praise of people or things, I’m recommending my shop of the year. 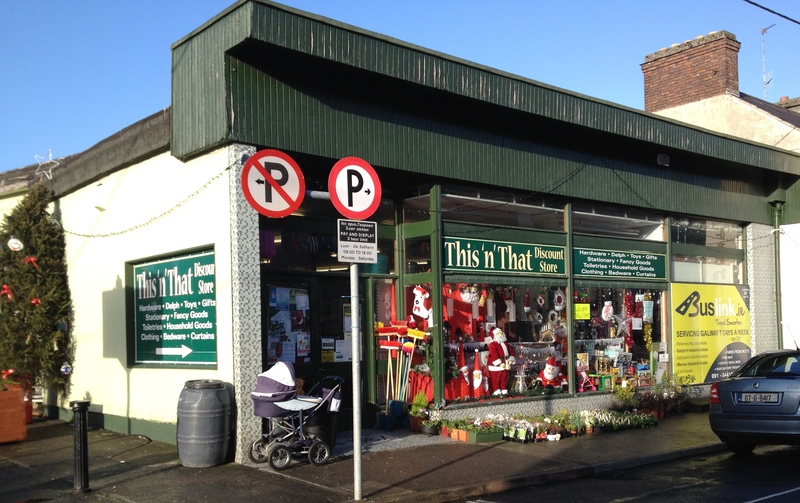 Unless you happen to live in the same village as me, chances are you will have never seen or heard of This ‘n’ That discount store in Athenry in the Ireland’s county of Galway. Nor will you ever find it online either, as this is your traditional shop that eschews all modern ways of selling and is truly bricks and mortar only. Tucked away in Northgate Street, near the town’s iconic arch from the original medieval walled town, This ‘n’ That, as the name suggests, sells pretty much every item you would ever need at a very reasonable price. From binders to bed sheets, clothes to car mats, heaters to hair brushes, toys to toiletries, it’s all here at a fraction of the high street or even online price. My daughter got about 8 Christmas presents for €18 in there the other day. Fabulous. It’s the staff that make a place in almost every service-led business, and this one is no different. There seems to be loads of staff working there at any one time, of varying nationalities. They are always super helpful and have the unerring ability to locate an item you need among a seemingly infinite array of stock, rather like those mechanics who can find exactly the wrench they need among what looks like a cultivated chaos. It’s cash only at This ‘n’ That. Credit cards would be a bit too 20th century. The staff check that battery-operated items like torches – flashlights to our American friends – work properly before selling them to you. Such a breath of fresh air compared to the usual grumpy curmudgeons you get in this type of shop. As our traditional shops get more and more squeezed by the massive malls or online merchants – creating what is known as the ‘donut effect’ in some English towns and cities – it’s local shops that sell a tablet case for €3.50, as opposed to 3 to 5 times that amount elsewhere, that will survive or even thrive. Cheerio 2013.